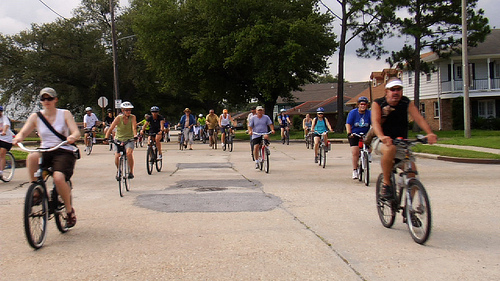 Levees.org offers a two self guided bike tours of major levee breaches and many other sights in New Orleans. The tours allow anyone, at any time, an opportunity to view the breach sites and neighborhoods nearly destroyed by the worst civil engineering disaster in US history. The three mile tour starts at the corner of Mirabeau Blvd and Warrington Drive at a state historic plaque. Following marked bike routes, the tourto the Flooded House Museum, the breach site of the London Avenue Canal and the Levee Exhibit Hall & Garden. Next is several points of interest and a second breach site on the west side of the canal. The final stop is a permanent pump station. From here, you can bike back to City Park or depart the tour and perhaps ride along the Lakefront. Bikers can use this interactive Google map (below). Levees.org also offers a self guided 12-mile tour which visits two breach sites of the London Avenue Canal and also the 17th Street Canal. CLICK HERE FOR DOWNLOADABLE 12-MILE TOUR MAP. Participation in Levees.org’s Self-Guided Bike Tour is undertaken at your own risk. Please use caution.